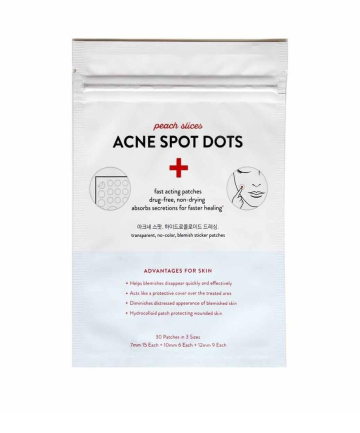 Peach Slices Acne Spot Dots, $4.49 Hailing from Peach & Lily's drugstore sister brand, Peach Slices, these acne patches have got it all: quality, value and cute packaging. With each pack, you get 30 patches in three different sizes, which makes them extra convenient and easy to use — and you'll find that they last you a pretty long time too (especially if you're thrifty like us and cut the larger patches in half). They're on the thicker side and really adhere to your face, meaning that they draw out a ton of oil and impurities from your pimples, shrinking them down almost before your very eyes. Suffice it to say, there's a reason why this nifty product picked up a 2018 TotalBeauty Award!